Called to the Bar 1990. 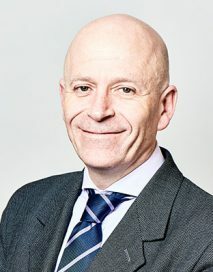 He has a very strong background in dealing with intractable residence and contact disputes and acting for the local authority and children in difficult and controversial public law cases. He has a reputation for being undaunted by a difficult or unpopular brief. In 2015 he represented the claimant in the first ever successful application brought for a Declaration of Presumed Death under the Presumption of Death Act 2013. Member of Family Law Bar Association, Resolution, Collaborative Lawyer, Member of the Chartered Institute of Arbitrators, Member of the Medico-Legal Society. Interests are family, family holidays, competitive cycling, supporting the children in sports and hobbies, church, charity fund raising, history, comparative religion (notably Christianity, Judaism and Islam), red wine and whisky. M v M (Contempt: Committal)  1 FLR 762For Respondent. Successfully established important principals in contempt of court proceedings where there is a parallel criminal case. Re Y (Evidence of Abuse: Use of Photographs)  1 FLR 855For the children. Established principals for obtaining and applying evidence from colposcopy. Re CC (Adoption Application: Separated Applicants)  EWHC 4815. Moylan JFor Local Authority. Child subject to care proceedings and placed for adoption and prospective adopters then separate and divorce before adoption order is made. Concluded. S v F  NE1400764. Roderick Wood J.Application to remove a Cuban-Italian child to Italy. Brussels II arguments over 2 days. Resolved. Instructed by Carol Lauder of Richmond Anderson Goudie, Chester le Street Durham. Against Elizabeth Lugg of Counsel. N v N  YO11D00617 HHJ Heaton QC.Case involving allegations of serious and material non-financial misconduct. Hearing over 5 days, October 2015. Listed for ongoing application to set aside previous ancillary relief order on grounds of failure to disclose previous marriage. For Respondent Wife. Re GK [on the application of ZLJ]  A03NE032. [report pending]HHJ Simon Wood. First successful application ever brought under the Presumption of Death Act 2013. For the Claimant. K v A  NE10D01458 unreported. For Applicant in spousal maintenance application.International/trans-jurisdictional assets. K v S  NE14J00887 unreported, Financial remedy.For applicant. Respondent received £2 million damages plus yearly income of £120,000 as part of damages award. Respondent had varying needs since award made. Senior Assistant Coroner for County Durham.